Thanks to a recent post at First Offenders, I decided it was time to nominate possible theme songs for Blogpocalypse. I've posted before on the different types of beer I drink and why. When mowing the lawn in the hot as hell Oklahoma heat, I'd often drink Coors Light because it was almost as watery as ... well ... water. And sweet merciful crap, people, it's hot as balls here in Baton Rouge today at 99 degrees. This is actually cooler than the 103 degree oven I experienced while visiting my in-laws in Memphis. But the humidity here in Baton Rouge is currently 650%. This is my way of saying that it's definitely Coors Light weather. Well, there are just too many nifty beers for sale at the little market across the street. 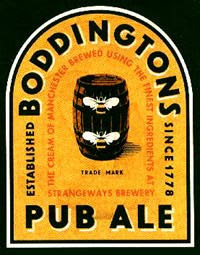 So I'm going with Boddington's Pub Ale today. Are you heading for Bouchercon in Alaska? Well, I hope to see you there. In addition to the cool Geezer Noir panel I'll be on (Saturday morning) I'll also have an "Author's Choice" thingy on Friday at 3:00 pm. 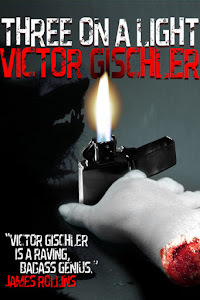 This will be Victor Gischler solo. Yeah, I'm worried too that nobody will show up. So I'm going to bribe you. I'll have a some kind of trivia contest or something, and all in attendance will have a chance to win copies of my novels. Or a Buick Skylark. You guess which. Too much of anything is ... AWESOME! Watching a television series can be annoying. Not because the show is bad (although many are) but because you have to wait a whole week between episodes. I've developed the habit of getting entire seasons of shows on DVD and watching as many episodes in a row I can until my eyes blur and I pass out. I did this with the BBC and American versions of The Office, and also one of my favorite shows The Venture Brothers. Also with the World War II program Band of Brothers since I'm too cheap to pay for HBO. About six or seven years ago, before my son was born, Jackie went away on a trip with her sister for Thanksgiving. I stayed home alone to enjoy some peace and quiet. I was assigned only one task. Record the 24-hour Thanksgiving Buffy the Vampire Slayer marathon on the VCR. Did you know most VCRs allow you to record one channel while watching a completely different channel? Yeah, I knew it too, but I couldn't do what probably any 10 year old kid could. I could not figure how to watch a different channel while recording Buffy. For the first 4 or 5 episodes I walked past the TV, ignoring the high school kids as they battled vampires and demons. About halfway through the marathon, I sat down to eat a sandwich. I didn't get up for three episodes, and I ended up watching every second of the rest of the marathon. Now Jackie (who is a very smart professor type person at LSU) has been asked to contribute an essay on Buffy to a book on the subject. Thus are we watching all the episodes a again. I consider myself a Willow fan. 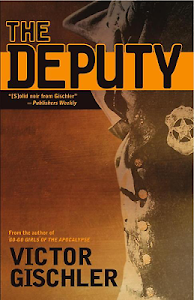 If you're coming to Alaska, I hope you'll join me and Frederick Ramsay, Sue Henry, Ken Bruen and Mary Saums for our GEEZER NOIR panel on Saturday at 10:00 in the morning. Did I mention I was up for an Anthony Award? Yeah, I'm surprised too. Man .. I love this show. Can I write for this show? A sign of the Apocalypse? Not really. But it is nice to see that Sean Doolittle has updated his website after several long years.